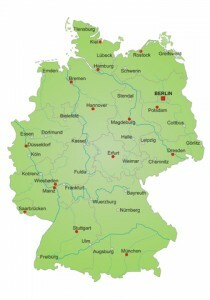 For further offices information or to search office space for rent in Frankfurt just click. Or contact us for any other office space query. A guide to flexible serviced offices and office space for rent in Frankfurt as well as general information that may be useful if you are thinking of renting offices or workspace in the city. Frankfurt, technically called Frankfurt am Main, is located on the River Main in the southwest of Germany, on an old ford. The city owes its founding and its name to the Franks, with Frankfurt literally translating to ‘ford of the Franks’. Indeed the first historical mention of Frankfurt comes in reference to the legendary Frankish emperor Charlemagne presiding over an imperial assembly in the city. Later Frankfurt grew to become one of the most important cities in the Holy Roman Empire and from early on was a centre of commerce, and hosted trade fairs where all attendants were under the protection of the Emperor. The first of these was recorded in 1150, the beginning of a practice with continues to this day. In 1372 Frankfurt became an Imperial City, answerable only to the Emperor, rather than local rulers. In the Napoleonic Wars, Frankfurt was bombarded by the French but escaped significant damage. The city continued to play an important role in events of the time and joined the German Federation in 1815. Eventually, Frankfurt lost its free status when it was incorporated into the province of Hesse-Nassau, later just called Hesse, of which it is the largest city of today. Frankfurt was occupied by French troops in WWI and later in WWII suffered extremely heavy bombing during which most of its remaining medieval buildings were destroyed. After the war, the West German government considered making Frankfurt the new capital but instead elected Bonn. In the 1970s the city was one of the first in Germany to construct an efficient S-Bahn and U-Bahn system and since the war, it has become Germany’s main financial and transportation hub, and one of the most important cities in Europe. Frankfurt is a city of vast economic importance both in Germany and Europe and has recently been deemed by Cushman & Wakefield as one of the top three cities for international companies in Europe. And a ranking by the University of Liverpool has found that the city is the richest in Europe by GDP per capita. Banking and financial services are the lifeblood of the city, to the extent that Frankfurt is often referred to as ‘Bank-furt’ and ‘Main-hattan’. A full six of the ten major German banks have their headquarters in the city, including the top three – Deutsche Bank, Commerz Bank and DZ Bank. In addition, more than 300 other national and international banks are represented in the city. The German Federal Bank has its headquarters in Frankfurt, as does the supremely important European Central Bank. Frankfurt also has the second largest stock exchange in Europe after the London Stock Exchange. 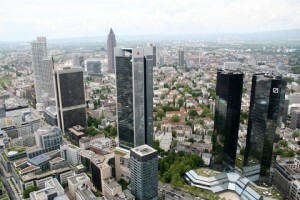 Besides banks, Frankfurt is well-known for it trade fairs. The city has a long tradition of hosting trade fairs and they have become an essential part of the city’s identity. The Frankfurt Book Fair is the largest of its kind in the world. As well as banking and trade fairs, other industries that are large in Frankfurt are advertising, consulting, accounting and the legal profession. As one would expect from a city as business-based as Frankfurt, jobs are abundant, with 922 jobs per 1,000 inhabitants. Quality of life is high in Frankfurt and Mercer Consulting included the city in its list of Top 10 most livable cities in the world. The city has cool winters and fairly mild summers, with an overall average temperature of ten degrees Celsius. The southern part of the city has the Frankfurt City Forest, which is the largest forest within a city in Germany, and the Main River runs through the centre of the city. The tourism industry is not hugely important to Frankfurt, though it does see thousands of visitors every year for trade fairs and business. However, there is lots to see and do in the city, especially when it is holding one of its frequent festivals. The Museumsuferfest is one of the largest cultural festivals in Germany and over three million visitors attend over three days, exploring the twenty-plus museums which stay open late into the night. The Sound of Frankfurt, a music festival, is also popular with visitors because of its open-air and free concerts. The city also boasts more than its fair share of ancient cathedrals and churches. Frankfurt is the most important transportation hub in Germany. Frankfurt Airport is one of the busiest in the world and serves 265 non-stop destinations. The airport is so busy that it has two train stations, one for regional traffic and one for international. It can be reached by car or bus and is only 15 minutes by train from Frankfurt Central Station. Frankfurt Central Station is the largest in Germany. The high-speed ICE trains run out of the station as do the regional lines. Both the S-Bahn and U-Bahn connect the station to the rest of the city. The S-Bahn and U-Bahn are how most of the city’s residents get around and are extremely frequent and user-friendly. Frankfurt also has an above-ground tram system and multiple bus lines. As one would expect of a city such as Frankfurt, it has a plethora of office space – to be exact 11.8 million square metres. Since 1996 an average of 200,000 square metres of new office space has been created every year. The turnover for 2009 was 350,000 square metres. Despite the abundance, there is still a considerable amount of potential office space. Based on planning applications, agreements and approvals, three million square metres more of office space can still be built. In 2017, office space take-up exceeded the 700,000 square metre mark for the first time ever – the total volume of take-up was the best performance in the history of the Frankfurt office letting market, apart from 2000. The most active tenant was Deutsche Bahn AG, which rented a total of around 85,000 square metres of space, corresponding to over 10% of the entire take-up volume. It is estimated that almost 30,000 square metres of lettings completed during 2017 were related to plans for Brexit. Frankfurt also benefited from the increased activity of the flexible workspace providers, whose takeup accounted for just short of 50,000 square metres in 2017. As vacancy rates of conventional office space diminish, flexible office and workspace office solutions such as managed offices and co-working spaces in Frankfurt are set to become more and more popular. There is further information on managed offices in this link and on co-working space on this link. Frankfurt has a vast selection of business travel accommodation options and we have partnered with Booking.com to bring you all of these in one place.